PARIS – October 17, 2018 Internet Without Borders is extremely alarmed by the proliferation of cyberbullying campaigns against journalists, bloggers and activists investigating bad governance, especially corruption, within the state and the business community , in Algeria. This is the case of journalists of investigation website Algerie-Part, who are regularly targeted by defaming attacks, threats, abusive judicial proceedings, DDoS attacks, and constant harassment on the Internet. While the digital has become the only space for free expression for the 19 millions Internet users of this Maghreb country, where President Abdelazziz Bouteflika has been ruling for 19 years, the Internet has been gradually transformed into a hunting field by those who are bothered by freedom of expression and free press. “We are very concerned by the reports we have received from Algeria about freedom of expression on the Internet: from the use of trolls, to the reporting of pages and social networks profiles, to attacks against websites, nothing is spared to discourage the necessary work to inform “, said Julie Owono, Executive Director of Internet Sans Frontières. 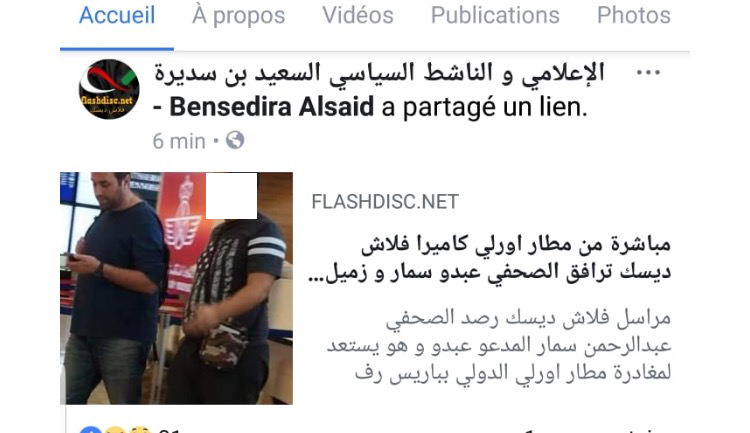 Abdou Semmar, editor-in-chief of Algerie-Part is the last victim as of this harassement: the website flashdisc.net explains that he is currently sought in an investigation into the alleged purchase of a property in Greece, which he denies, and that the police and security forces are mobilized to arrest him. “I strongly deplore the unhealthy climate in which some malicious lobbies want to lock us into, in order to prevent us from exercising our freedom of expression, and I condemn these campaigns of threats and denigration that affect our moral integrity,” he declared to Internet Without Borders. Internet Without Borders urges the Algerian authorities to respect their international commitments, and to take all necessary measures to stop this cyberbullying, and preserve the freedom of expression, and the free press on the Internet.